Flu Season is upon us - All eligible patients aged 18 and over are welcome to book an appointment with a member of reception if they have not yet received their flu vaccination for this flu season. All practices are required to allocate a named, accountable GP to all patients, including children. As the practice operates a personalised list your registered GP is your named, accountable GP, who is responsible for the provision of your healthcare. 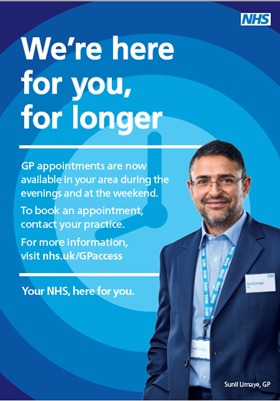 Please ask your doctor, or the reception staff if you would like to know who your named GP is. Please read our extended access patient information leaflet saved under the services tab. The average pay for GPs working in Wem Medical Practice in the last financial year was £60,724 before tax and National Insurance. This is for 8 part time GPs who have worked in the practice for more than six months. Automatic front door access suitable for wheelchairs is available at both Wem & Prees and both surgeries also have disabled toilets. Please note all inbound and outbound calls from Wem & Prees Medical Practice are recorded for training and monitoring purposes.